Litecoin price traded toward $215 before starting a downside correction against the US Dollar. 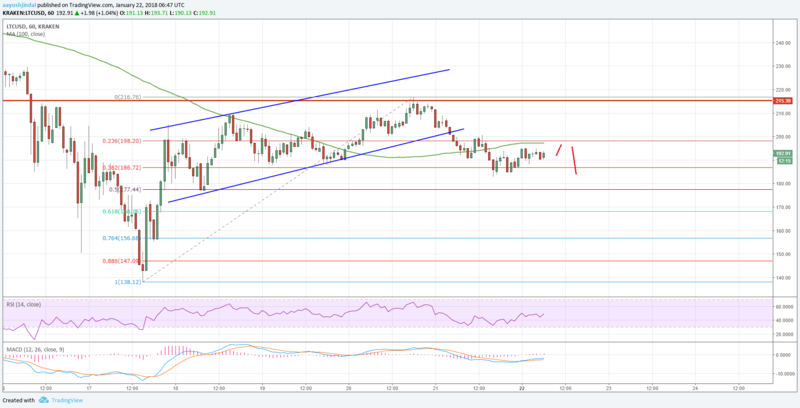 LTC/USD is currently below 100 SMA and is trading in a range above $180. Litecoin price made a short-term top near the $215 level and declined (Data feed of Kraken) against the US Dollar. There was a break below an ascending channel with support at $204 on the hourly chart of LTC/USD pair. The pair is currently below 100 hourly simple moving average and is holding the $175-180 support. A minor recovery was initiated this past week above $180 in litecoin price against the US dollar. The LTC/USD pair traded above the $200 level and moved into the bullish zone. However, the pair faced a strong selling interest near $215 and started a downside move. It traded below the 23.6% Fib retracement level of the last upside wave from the $138 low to $216 high. More importantly, there was a break below an ascending channel with support at $204 on the hourly chart. The pair moved below the $200 support and the 100 hourly simple moving average. At the moment, LTC/USD is holding the 38.2% Fib retracement level of the last upside wave from the $138 low to $216 high. It may move a few points higher, but the $200 level and the 100 hourly SMA may act as hurdles for buyers. Should the price move past $200, it could retest the $215 level. On the downside, a push toward the $175-180 support area is possible in the short term. It is a crucial support and presents the 50% Fib retracement level of the last upside wave from the $138 low to $216 high. It seems like the price is trading in a range above the $180 level and below the $215 resistance. LTC/USD may continue to trade in the mentioned range before making an attempt to break the $215 resistance. On the downside, the $175 level is a pivot zone, with the next support around the $140 swing low.